Children begin learning about animal species, their habitats and behavior during elementary school. Kids instinctively love animals. Children begin learning about animal species, their habitats and behavior during elementary school, and this is when children also become more interested and involved in caring for family pets. They may even become pet owners for the first time at this age. Learning about animal care is fun for kids, while also teaching them life lessons about empathy, compassion and responsibility. Here are five important facts that children need to know about pet care. • All pets need water. Water is essential for every pet, every day (some even live in water). Keep water dishes or bottles clean so their water is always good to drink. • Pets need particular food. PetSmart is a great place to find the right food for any pet. While some (like rabbits) eat fresh vegetables like you, most pets don’t thrive on people food. Feeding them scraps from your plate is not a good idea, as some food might be bad for them. • Each pet needs a different habitat. While cats or dogs share our homes, others require special houses. Fish need aquariums with water that’s filtered, at the correct temperature. Smaller pets need cages — they’re not litter-trained, and they’re small enough to get lost in your house. Reptiles need glass enclosures called “vivariums” and require heat to be comfortable. Birds need cages to prevent them from escaping. Whatever habitat your pet requires, it’s important to keep it clean and give them toys to entertain them. • Pets need socializing. Just like people, pets can get lonely. Dogs need lots of human time, and walks to go to the bathroom and exercise. While cats seem like loners, they’re actually quite social. Even a cat who doesn’t want to cuddle may sit nearby. Fish or gerbils are more contented with the presence of an animal of the same species. Adopting two pets together can prevent loneliness. • Just like you, pets need check-ups. Finally, most pets need regular check-ups. Vet visits can be costly, so before becoming a pet owner, make sure you’re prepared. Pet ownership is a serious responsibility — their health and care is now up to you. Understanding these important facts about pet care for each type of animal can help every family find the right pet. According to the ASPCA, about 3.2 million cats and 3.3 million dogs are brought to shelters each year. Whenever you’re looking for a pet, remember that there are always many more available than human families to give them homes. Individual pet owners, families, communities and companies can all play a part in ensuring that animals are provided shelter while they wait for their forever homes, and in encouraging their adoption. Animal companions give so much to the families who love them, and communities can help more pets get adopted by providing know-how. 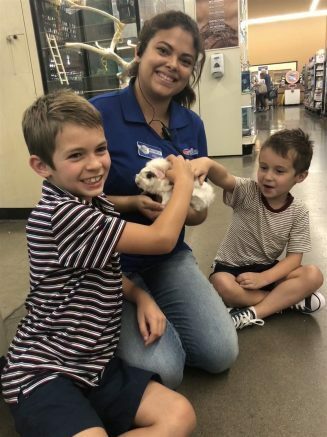 Learning which type of pet may be right for you and your family can start with a program such as Pets Like U at PetSmart stores around the country. Specially designed and supported by the Field Trip Factory for grades K-2 or 3-6, the program teaches children about the needs, care and behavior of different types of pets, whether furry, fishy or scaly. “Our experiential programs teach students important life skills within real life environments in a fun and engaging way. We receive consistent feedback from educators that their students show greater retention of the key learning concepts and higher interest in the corresponding curriculum subject,” says Field Trip Factory president Etienne Veber. Be the first to comment on "Five important facts to teach kids about pet ownership"